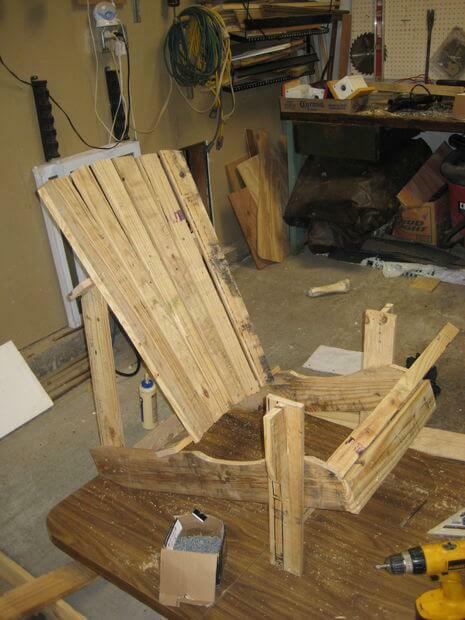 Can you believe the picture of the above Adirondack chair was made from pallet wood? It was. 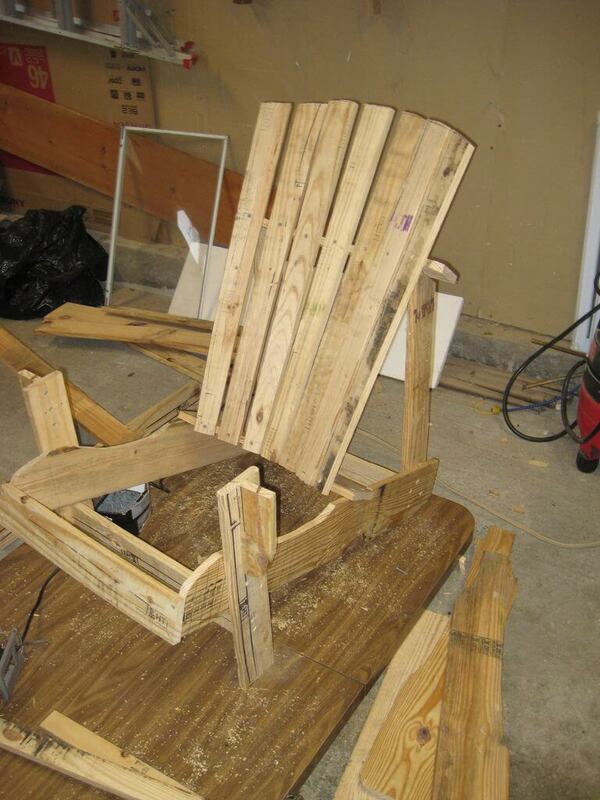 If you think that’s cool and would love to build your own Adirondack from pallets, you’re in the right place. The first time I sat in an Adirondack chair, I fell in love. You see, I love comfortable furniture. I love reclining. I love putting my feet up. 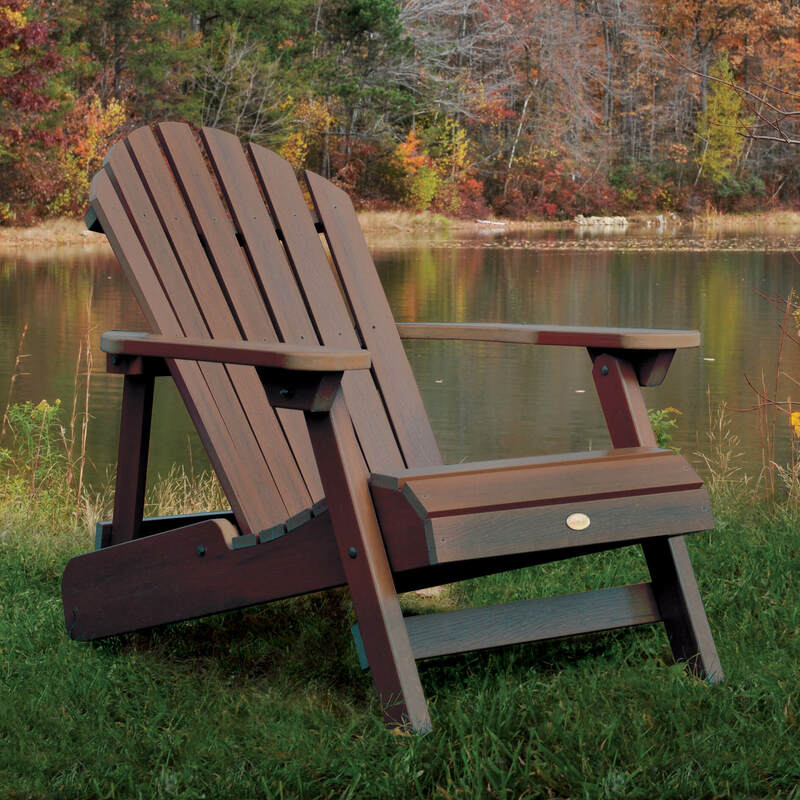 The Adirondack is the perfect deck chair because it looks great and is super comfortable. There’s no rule saying you can’t add some cushions to make it even more comfortable. While you can buy inexpensive plastic Adirondacks, there’s something special and timeless about the wood variety. 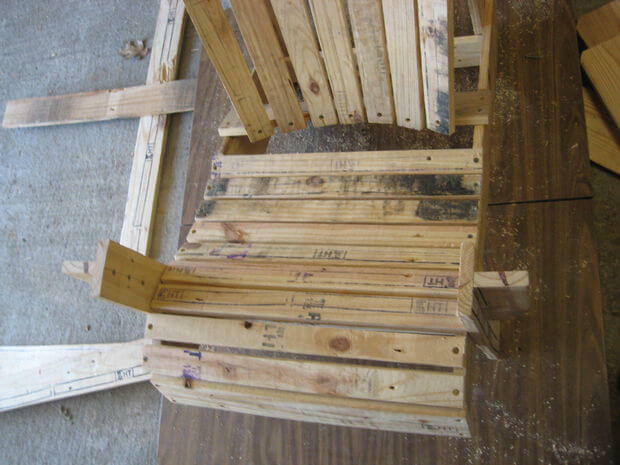 The following is our lengthy and detailed step-by-step image-rich tutorial on how to build an Adirondack chair with pallets. 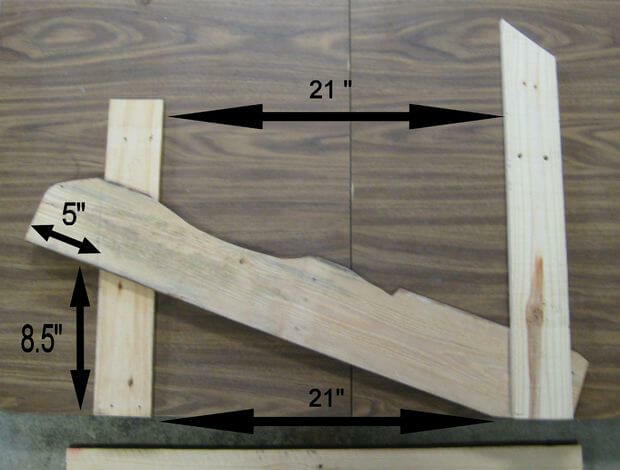 Click here to read our brief tutorial on how to dismantle wooden pallets. 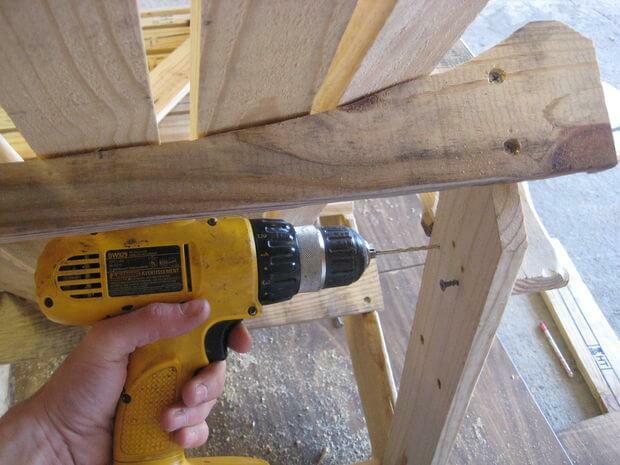 Once your pallets are dismantled, here’s what you do. On a 35″ 1×6, draw a grid of one inch blocks as pictured. 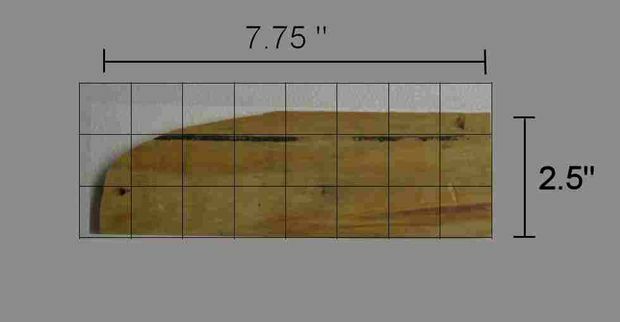 Remember that the wood is only 5.5″ wide. 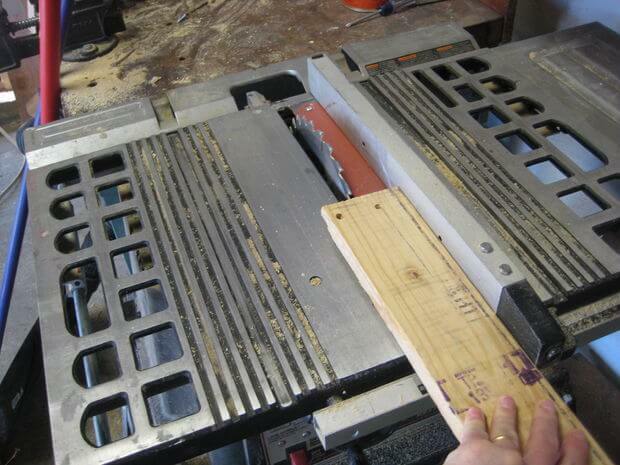 This will result in a course of 1/2″ blocks at the top. Using the 1/2″ blocks, draw the pattern one at a time. This requires two; use the first to trace the second. Keep in mind: If part of the board is better quality than the other, cut accordingly. Put simply: the stringers should be mirrored. Pallet wood often one smooth and one rough side. Using a 32″ 1×6, again draw a grid of one inch blocks as pictured. The result will be a course of 1/2″ blocks at the top. Repeat the process of using the blocks to draw the pattern. Using a 21.5″ 1×4, draw a grid of one inch blocks like the picture below. 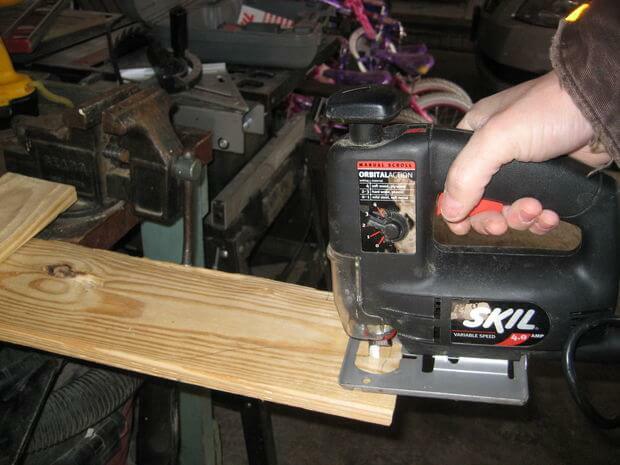 Keep in mind that the lumber is only 3.5″ wide. you”ll end up with a course of 1/2″ blocks at the top. Using the blocks, one at a time, draw the pattern. Using a 22″ 1×4, draw the same grid of 1″ blocks. Using the resultant 1/2″ blocks, draw the pattern. 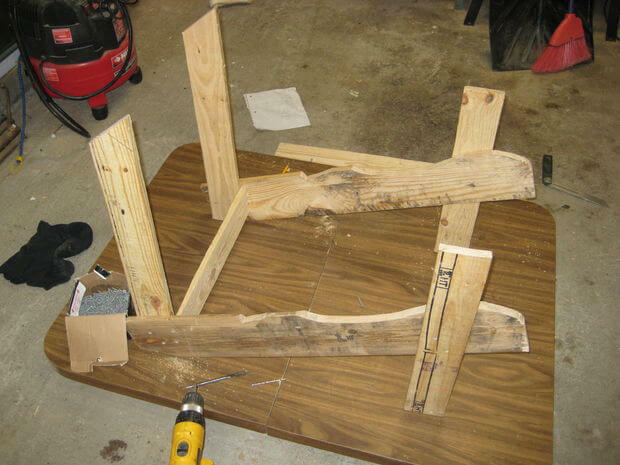 Cut out 2 armrest brackets using the measurements pictured. 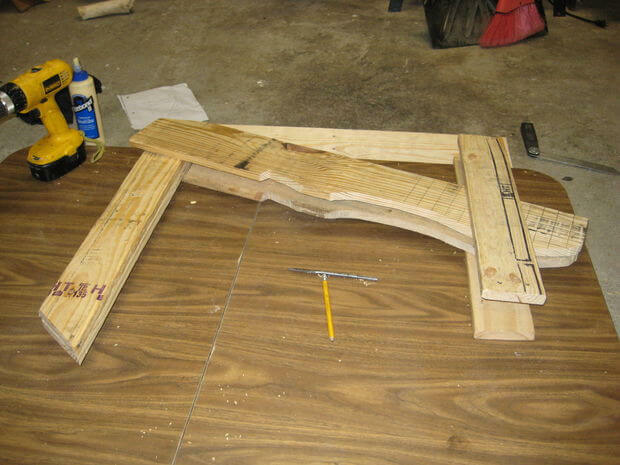 Using your saw (jig or bandsaw if you have one), cut out each of the pieces. Ensure the pieces are clamped down securely. You’ll need two each of the rear stringers and armrests. Trace the first one after it’s cut out, and you can avoid having to draw the grids again. 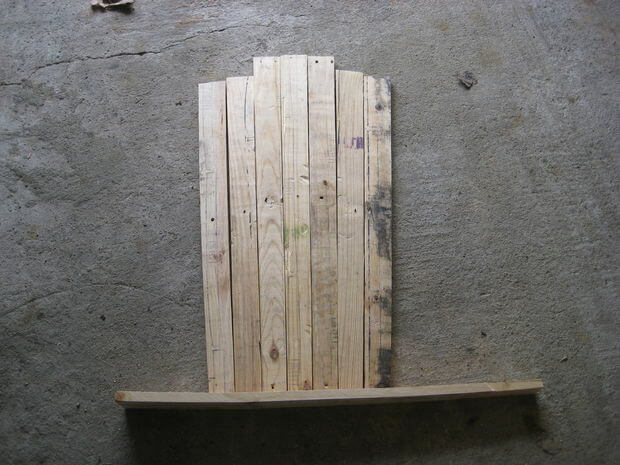 You will need four 20″ x 3.5″ boards for 2 front legs, 1 front crosspiece, and 1 front seat slat. 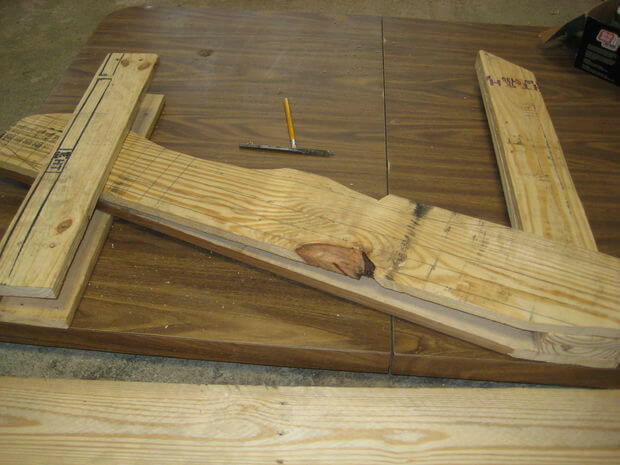 These can be cut with a handsaw, a table saw, or a circular saw. Be sure to label these pieces. Use a pencil or chalk and write “front leg” on two, “front cross” on the third, “front slat” on the last. Do this in an unobtrusive place, and in small writing, as the marks may be visible after finishing otherwise. 10. Cut the rear crosspiece. As shown, cut one 18.5″ x 3.5″ rear crosspiece. The chair will need 2 rear back supports. Grab a 1×4 and measure 26″ on one side, and 23″ on the other. Draw a line between the two and proceed to cut. 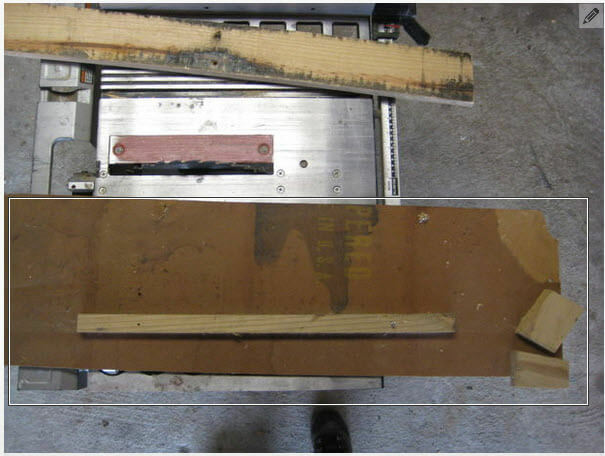 Split a 3.5″ inch board at its center to get two 1.75″ seat slats. Cut the length down to 20″. Next, drill pilot holes and countersink on each end of the piece. The hole should be made within 3/4″ of the end. 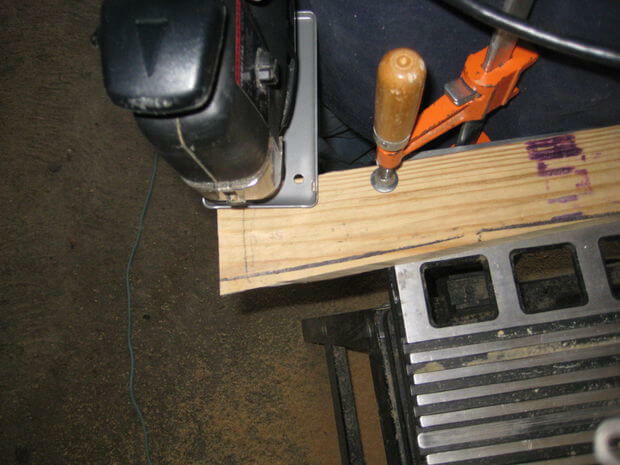 In practical terms, you can simply eyeball it, getting as close to the edge as possible without allowing the countersink to ruin the piece of wood. You’ll need 9 of these slats. For this project you’ll need 7 chair back slats. These are going to be tapered cuts. 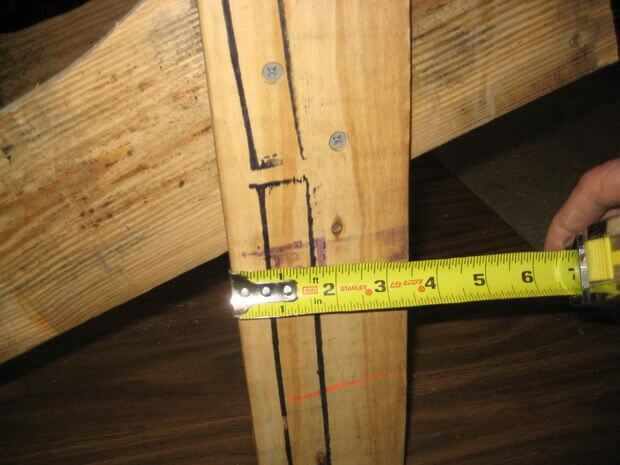 You can simply mark the board from the pictured measurements and use a circular saw to cut the taper. When we did this, we marked the length approximately. This is an opportunity to use some of your less than perfect boards. Any piece from from 34″-36″ should work well. 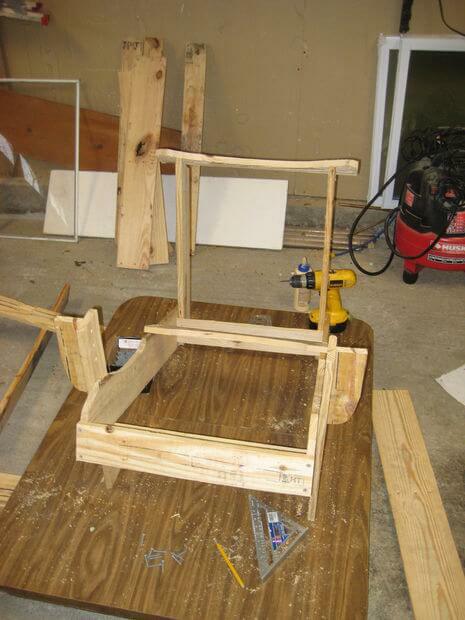 In later steps, we will trim the tops to make the fan shape at the top of the chair. 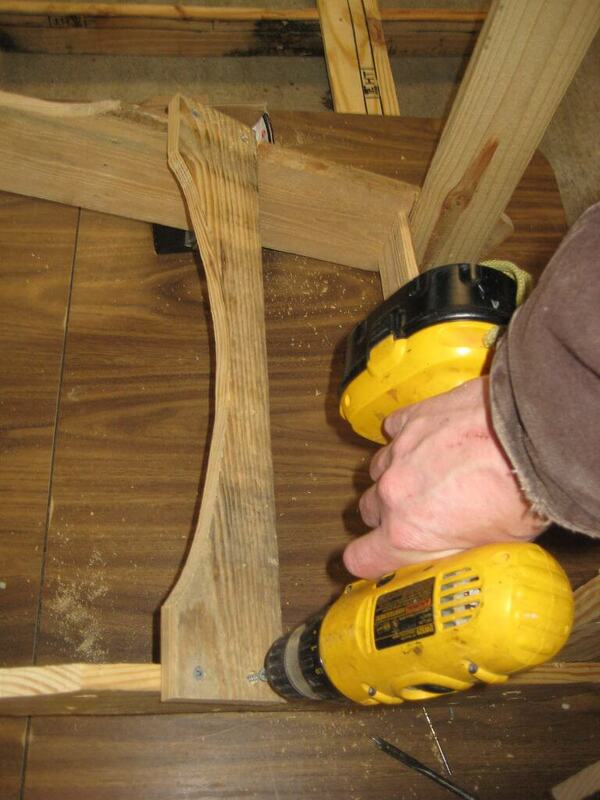 In order to properly cut the fan tail, lay the back slats together as shown. Use a board to line them up on the bottom edge. Tie a pencil to a couple of feet of string. 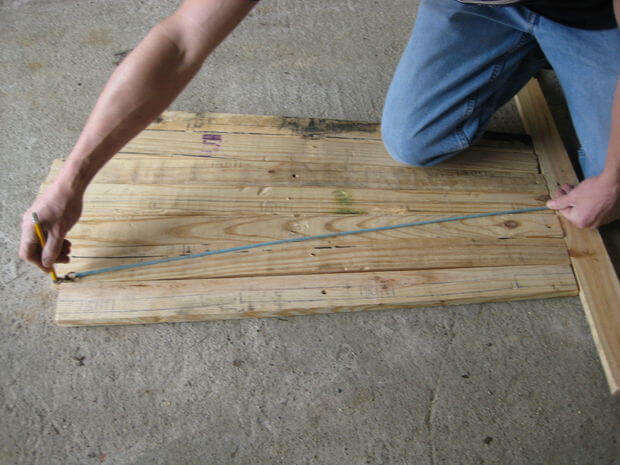 Using your thumb to hold one end of the string in the middle of the center board, at the bottom, etch an arc into the top edge of the boards. Of course, if your boards are different lengths, make sure to place the shorter ones at the edge, with the longer ones in the center. After you draw the arc, number the boards with a pencil so you know what order they go into later. 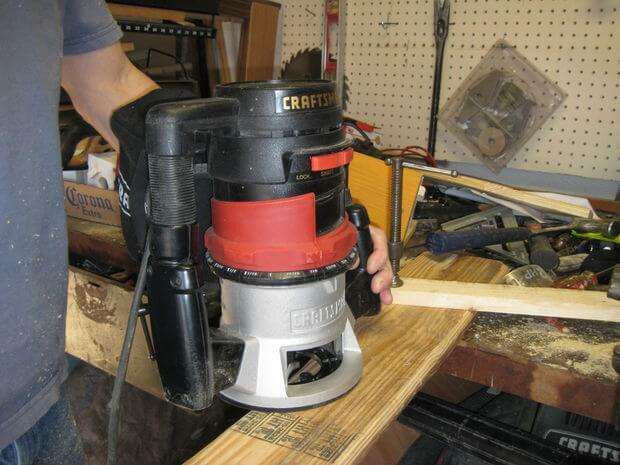 Use a jigsaw to trim the ends of the boards. Your chair backing should look close to this image. 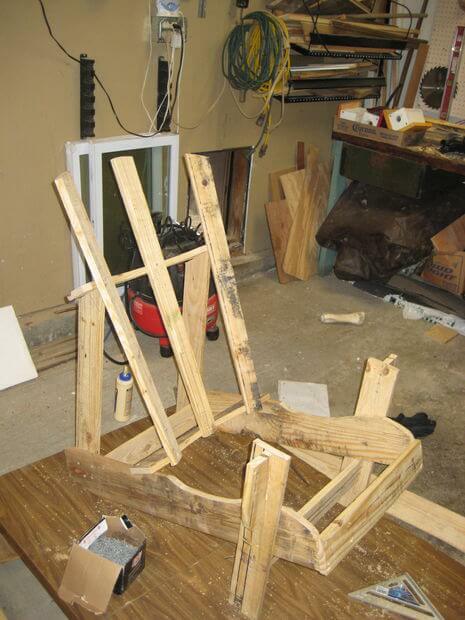 Now we’re ready to start piecing this chair together. 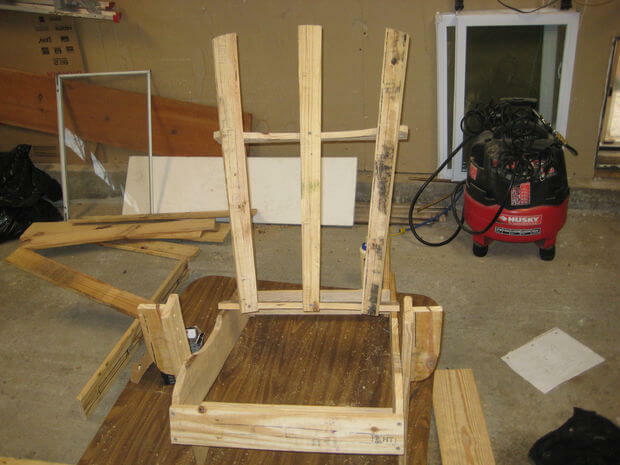 On a flat surface, arrange the front leg, rear back support, and seat stringer as shown. 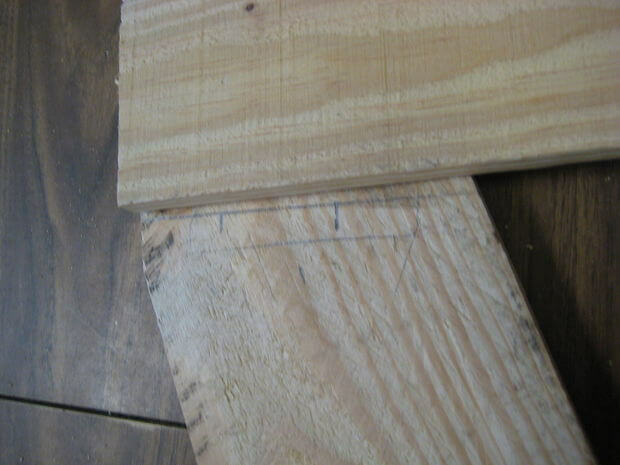 Note: if your boards are smooth on only one side, make sure the better side is facing out. In this picture, you’re looking at the rough side. Remember: The front leg goes UNDER the seat stringer. The back support goes OVER the seat stringer. 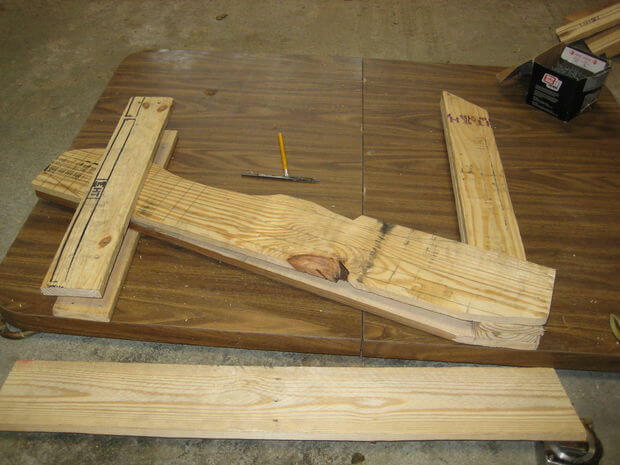 Use a straight board or table edge to line up the pieces on the bottom. 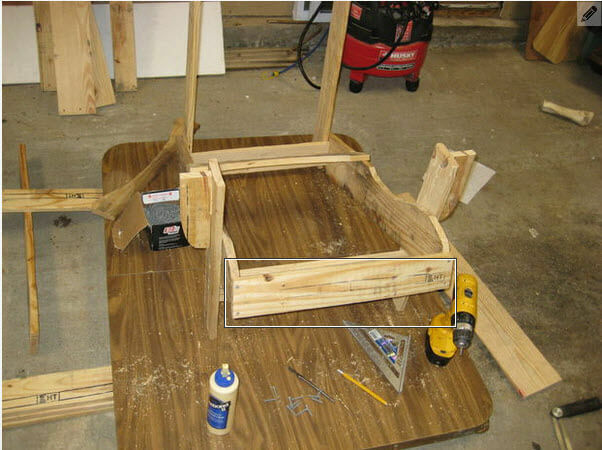 Measure the distance between the front leg and the rear back support on top and bottom to ensure that it is straight. 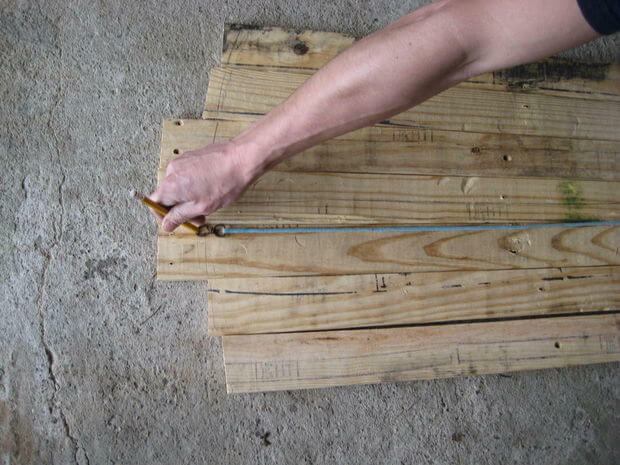 Mark the leg and support locations with a pencil or chalk.You may have to make small adjustments to account for warped materials, but that can be part of the fun of recycling a pallet. 19. Drill pilot holes, countersink, then attach the front leg. Drill two staggered pilot holes through the top board and only halfway through the lower one. 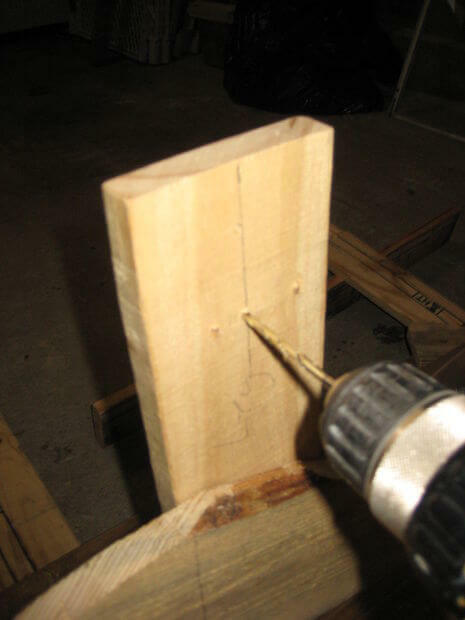 Use the 3/8″ drill bit to countersink the holes. 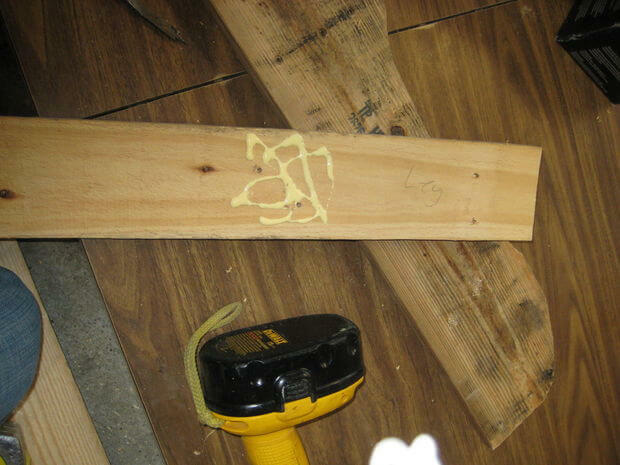 Spread glue between the two pieces and attach with 1″ wood screws. Note: Pallet wood can be overly soft. Set the drill’s torque as low as possible to avoid stripping the pilot hole. 20. Drill pilot holes, countersink, then attach the rear back support. Do not forget the glue. Ensure the back support is evenly spaced, about 21″ from both the top of the front leg and the bottom. Similar designs can incorporate a carriage bolt, washer, and a nut here, instead of two screws, which is a stronger way to go. Place the finished seat stringer/front leg/backrest support on your workspace, using it to line up the opposite assembly. Keep in mind that these should be a mirror image. 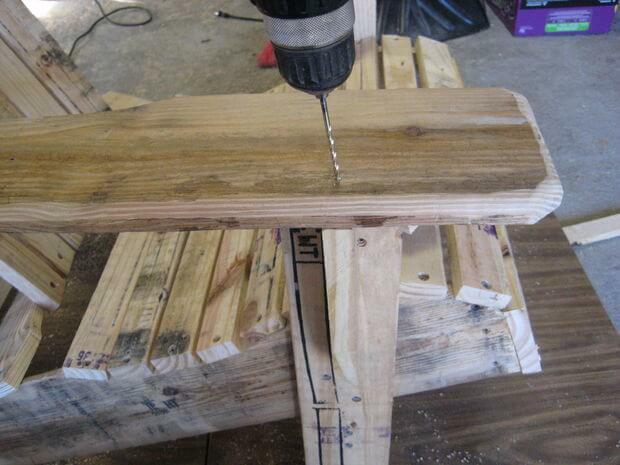 Mark your board locations, drill, countersink, glue, and screw it in. Take your single 18.5″ x 3.5″ rear crosspiece and attach it to the seat stringer/rear back support as shown. 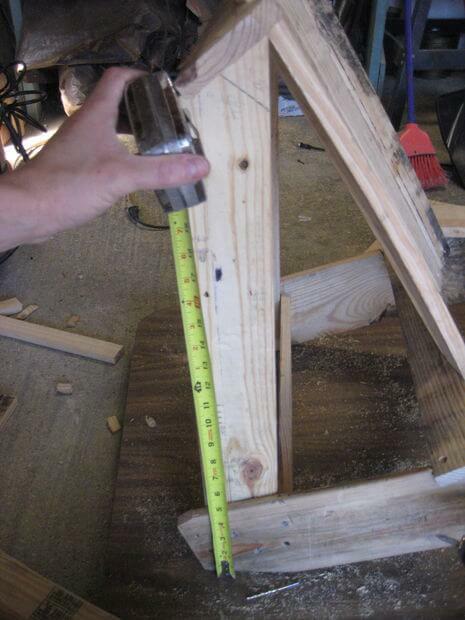 Measure 1 inch from the top of the seat stringer, letting you know where to attach it on the other side. Remember to drill, countersink, and glue. 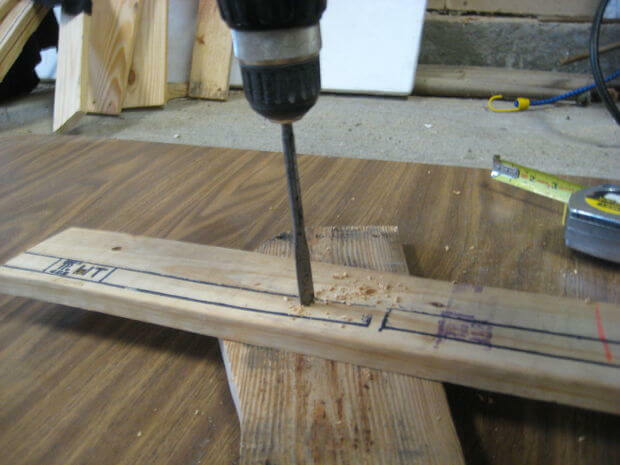 A useful step would be to mark and trace where you want your screw holes. 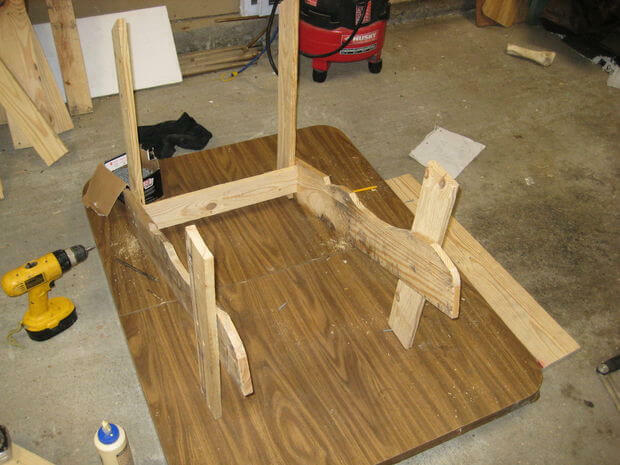 Mark and measure the other front leg, seat stringer, and back support, so you can attach the rear crosspiece. Connect it in exactly the same place as on the other side. Make sure to glue. Connecting the front crosspiece will be easier than the rear one. 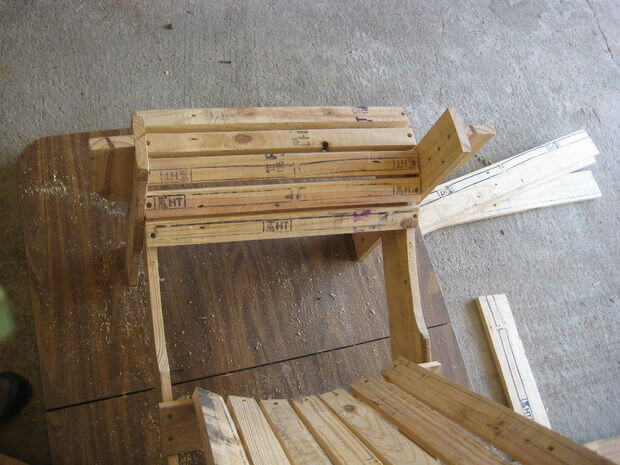 Mark and measure the center of each front leg, beneath the seat stringer. 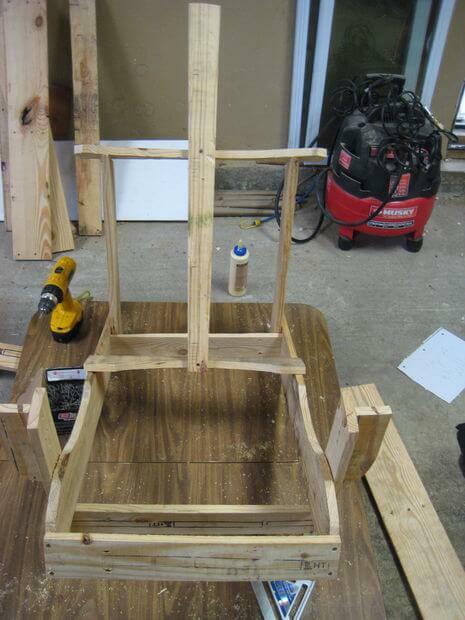 Hold the crosspiece up so that it touches the seat stringer, and attach to the front leg with glue and screws. 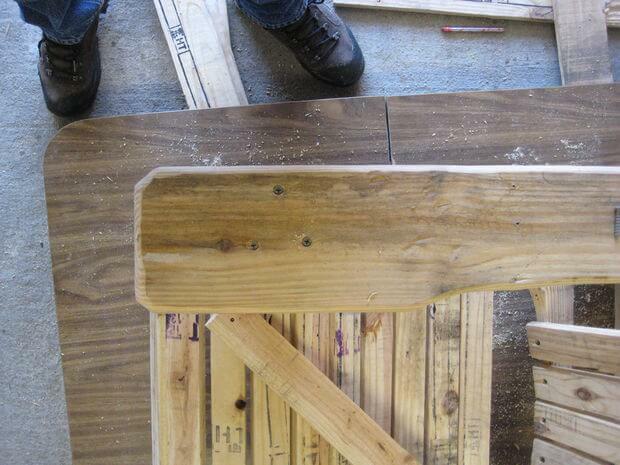 Earlier, we had you cut two backrest rails. One is square, while the other is rounded. The bottom backrest rail is the square one. Take this piece and lay it into the two grooves cut into the seat stringers. Next, drill pilot holes, countersink, then glue into position. 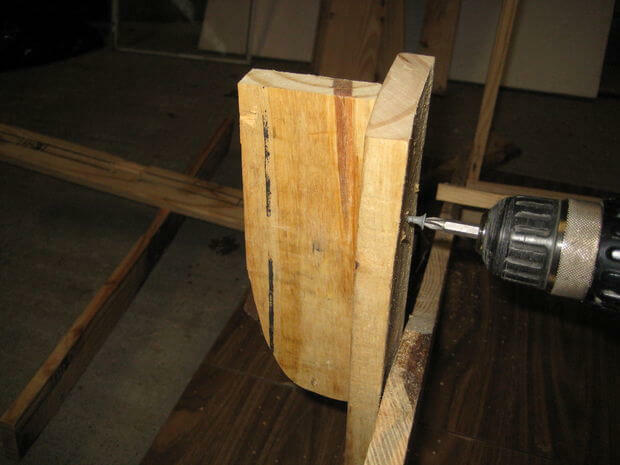 Use four 1″ wood screws. Take the rounded backrest rail and mark it at 2.5″ from either side. The distance from each side should be 18.5″. Drill and countersink two holes on each side where you marked it. 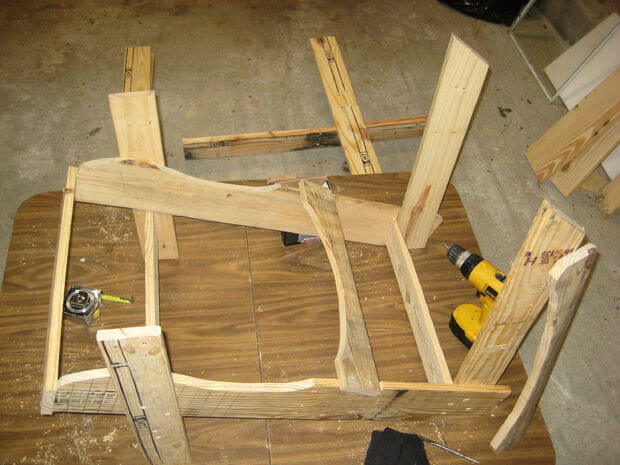 Place the backrest rail over the rear back supports and attach with glue and screws. Note: you may have to squeeze the rear back supports together to get them plumb. Measure and mark the center line of the top of the front leg, then drill your pilot holes, countersink, and attach the armrest brackets. 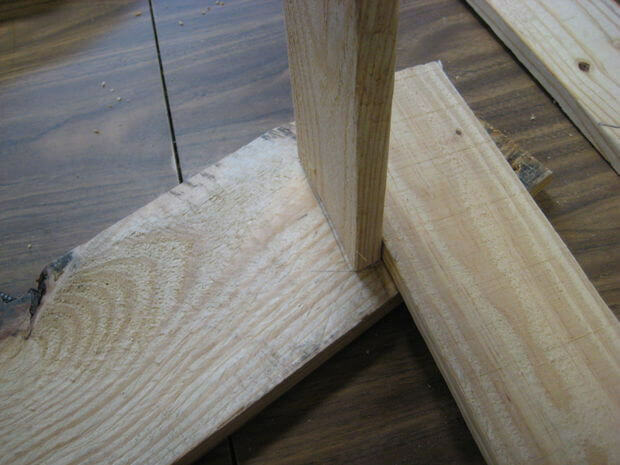 Make sure the top edge of the bracket is level with the top edge of the front leg, and do the same for the other side. Glue and screw in the front seat board. Drill pilot holes and countersink. Find and mark the center of the top and bottom back rails. Drill and countersink a hole on the bottom of the slat, then attach this to the bottom back rail. Line up the top piece, drill, countersink, and attach. 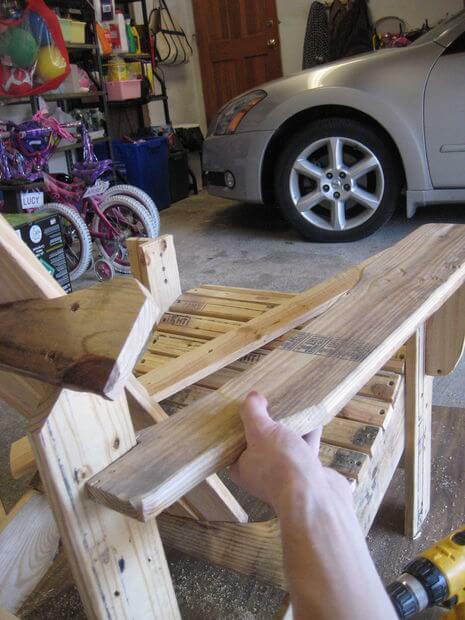 We advise against using glue on the back slats, as you may want to adjust them later. Attach the first and seventh back slats to the bottom back rail. 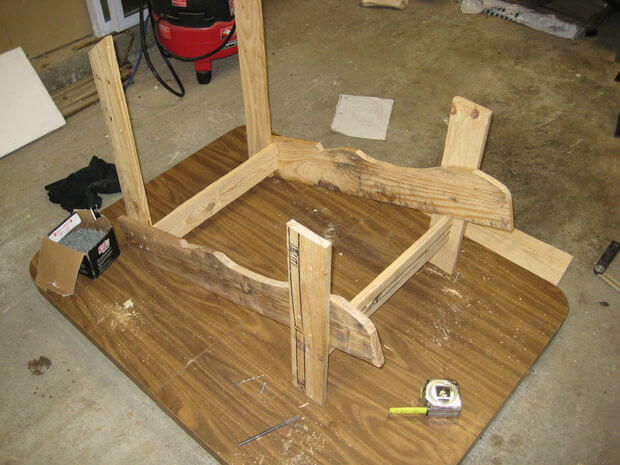 You will want to dry-fit the two armrests before you attach the back slats, to ensure you’re leaving enough room to attach them. 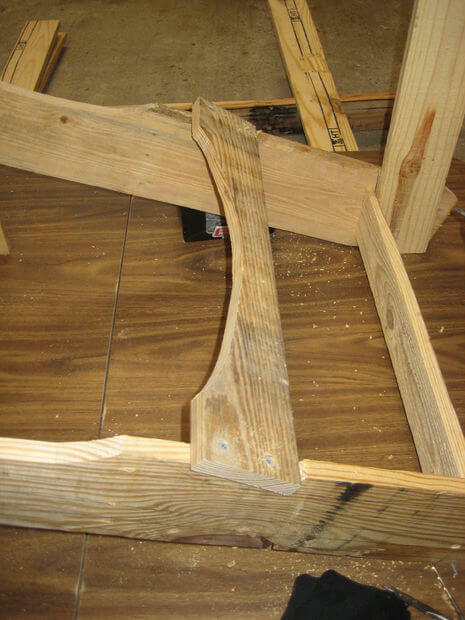 After you connect the bottom of each slat, attach the top piece. Next, attach the remaining slats in the same manner as the first two, spacing them as evenly as possible. For this major step, you’ll want to dry fit all the pieces first, to give you an idea of how to space them. 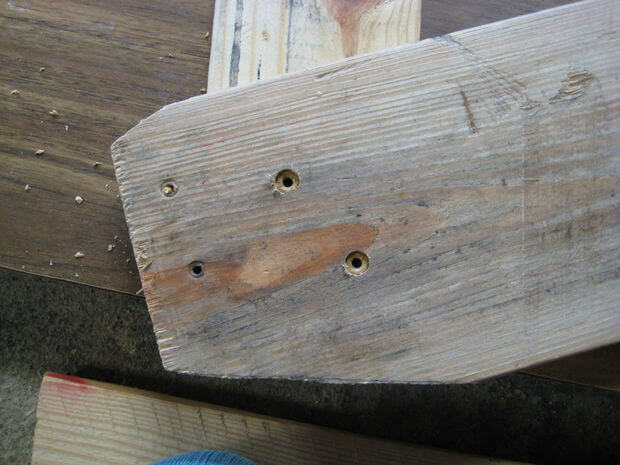 This will take some time, as you’ll want to be extra careful drilling the pilot holes into the seat stringer without ruining any of the pieces. 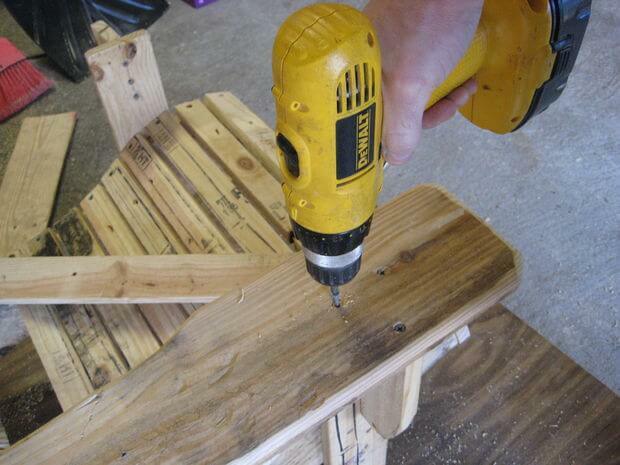 This step isn’t 100% necessary, but if you have the means, we recommend routing the edges of the armrests. If not, skip to the next step. First, measure and mark 20″ from the bottom of the rear back support. Next, move the armrest into position. The 20″ mark will line up with the bottom edge of the armrest. 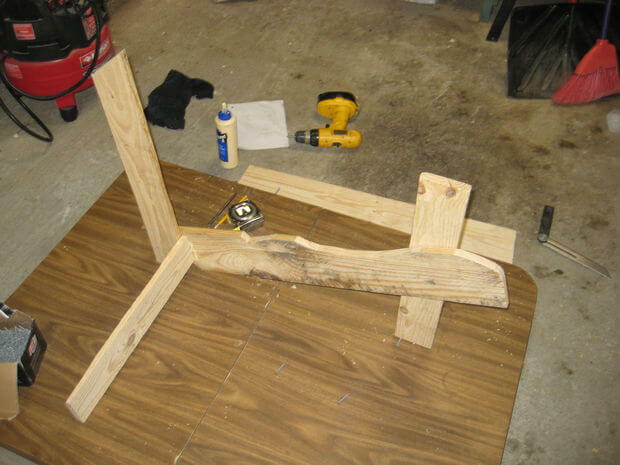 Use a screw to tack the armrest in place, or clamp it. Make sure that it’s kept in place. 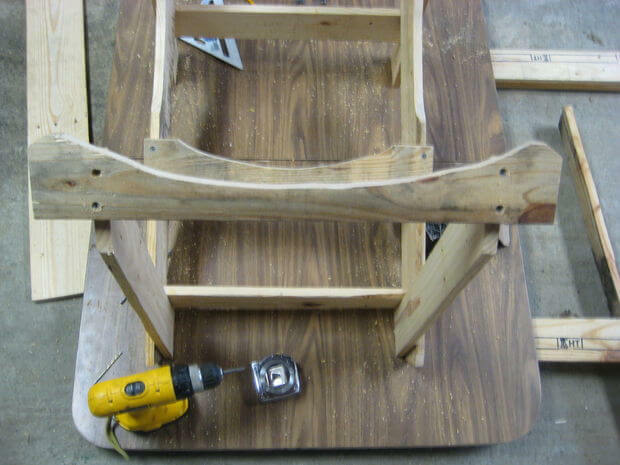 Next, drill 3 pilot holes through the armrest, into the front leg and armrest bracket. See the middle image for the proper pattern. Countersink the pilot holes and fasten with screws. 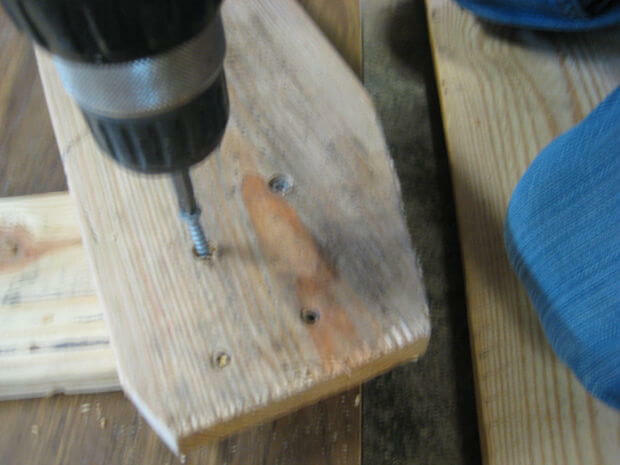 Now, drill two pilot holes and countersink to attach the rear part of the armrest, and attach it with two 1.25″ screws. Similar designs can incorporate a carriage bolt, washer, and nut here, instead of two screws. If you have the means, this is a stronger way to go. For the final details, get wood putty and start filling all the holes you can manage. We advise wiping off any leftover putty with a wet cloth while it’s still fresh. Sanding can mean more trouble than it’s worth, and may also ruin the way your given stain or paint looks. Now you can start sanding the chair down. At the very least, lightly sand off the shiny glaze, allowing for stain penetration or paint adhesion. 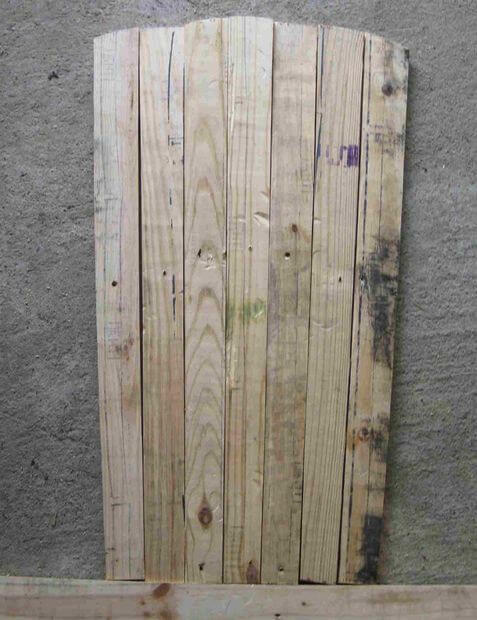 In the case of recycled pallet wood, we use a dark stain, which hides imperfections in the wood. Project (images and instructions) performed and provided by John Kratman – who kindly granted us a license to publish this tutorial. for 75 more chair plans. 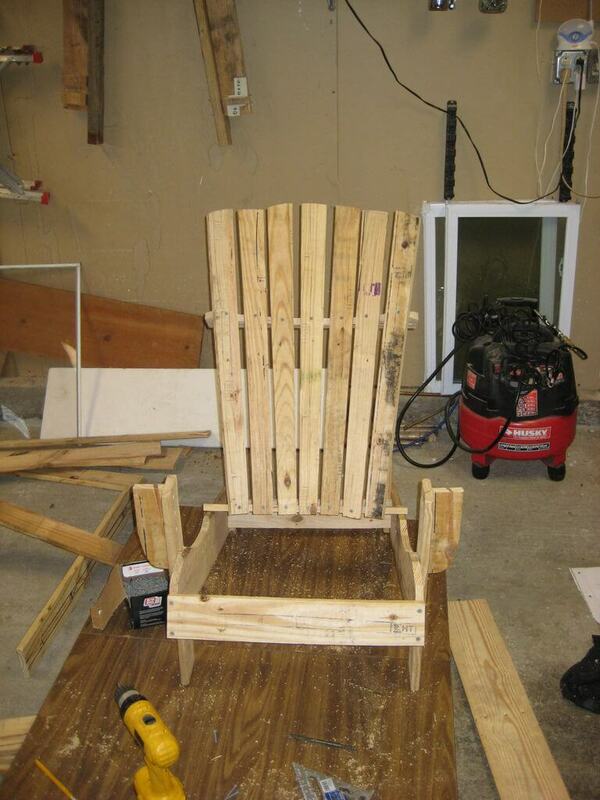 Check out the following Adirondack chairs (buy instead of build). 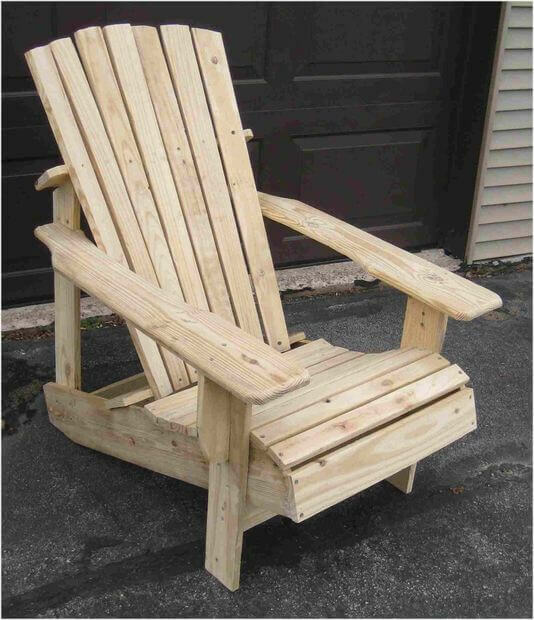 to learn more about this folding wooden Adirondack chair (a best seller). 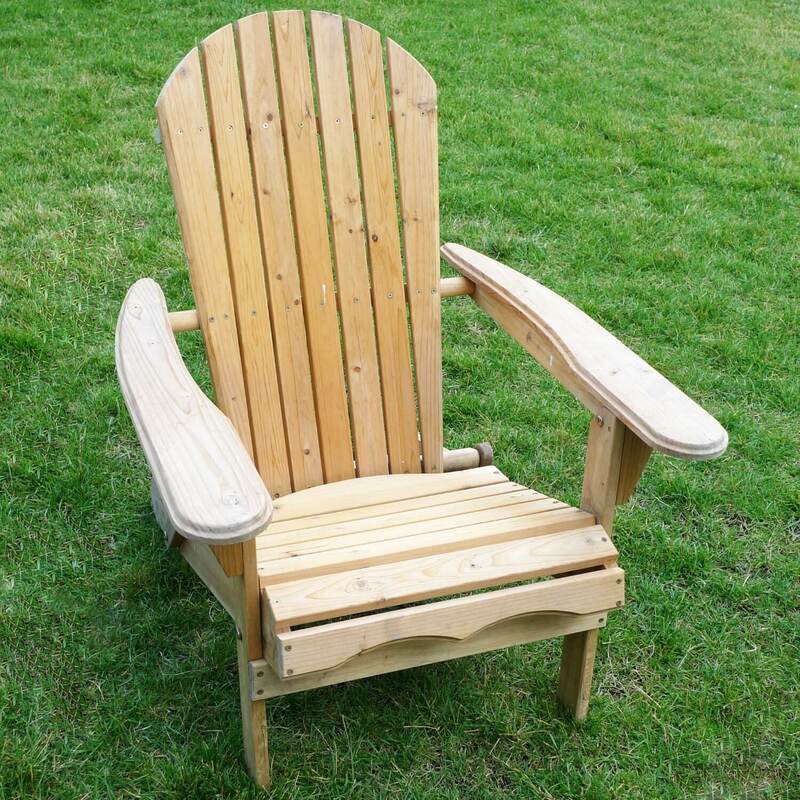 to learn more about this elegant Adirondack chair.